The capital city of the Republic of Armenia - city Yerevan (latitude 40օ10'40''N, altitude 44օ30'45''E) has a total area of 223 km2 and 1.06 million population. Major land use types of the city are primarily residential, industrial, and commercial. Since Soviet times the city was known by the high level of pollution with toxic elements, which still exists in the city environment (https://doi.org/10.1016/j.gexplo.2016.04.006). 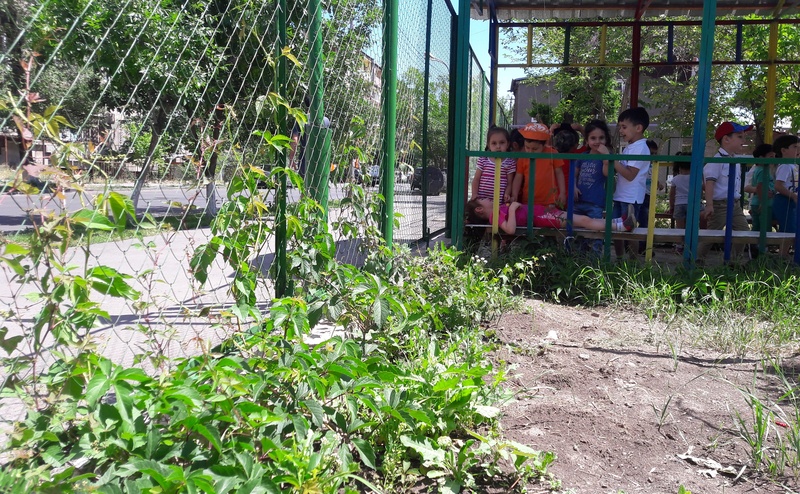 In the city more than 160 kindergartens are operating and some of them are located in the most polluted part of Yerevan. The study conducted in 2012 showed that more than 100 kindergarten’s territory soils are polluted by a number of toxic elements (https://doi.org/10.1016/j.ecoenv.2017.04.013). Some of these kindergartens are spatially located just in front of street with heavy traffic and do not have any barrier preventing the penetration of pollutants (i.e. vehicular emission) into the kindergarten area. The testing site - kindergarten was built in former Soviet Union period and did not underwent any reconstruction action. Due to its spatial location the kindergarten is experiencing a significant impact from the heavy traffic from street site and the its territory is open for the migration and accumulation of pollutants into the playground soil layer. The study showed that selected kindergarten soils are highly polluted (https://doi.org/10.1016/j.ecoenv.2017.04.013) and toxic elements pose a risk to children health. Therefore, it is a major challenge to reduce pollution level and prevent further penetration of pollutants into the N143 kindergarten territory regarding, which a nature-based solution was applied. The NBS “Green wall for kindergartens” was planned in the frame of H2020 Connecting Nature project (www.connectingnature.eu). The H2020 Connecting Nature project helped to integrate the 'Nature-Based Solution' concept into Green City Action Plan, which articulates a Yerevan’s sustainable development vision, strategic objectives and actions and investments to address priority environmental issues and meet the plan’s objectives (https://www.yerevan.am/en/yerevan-green-city-action-plan/) The funding for the green wall creation was provided by the “Eurasia” CPO (http://eurasia-cpo.com/en/). The implementation of nature-based solution on the territory of Yerevan has more than 10 years of history. Particularly, according to the Yerevan Municipality request The Center for Ecological-Noosphere Studies (CENS, http://cens.am/) developed a “Target tree planting program” which was a unique and scientifically justified strategy for environmental pollution mitigation and prevention. The implementation of Yerevan’s “Target tree planting program” is still in the process. The creation of a green wall in the sounding of N143 kindergarten is a showcase of the way a particular nature-based solution could be implemented: the creation of a green wall, which took a short time and needed a very limited, care may than keep its function during years without any extra-costs. It is also an excellent example for the other kindergartens, schools and sport complexes where such kind of nature-based solution can be easily implemented. The green wall in the sounding of N143 kindergarten may ensure sustainable environmental conditions including better air quality in the kindergarten territory. The care of the plant species (Virginia creeper (parthenocissus quiquefolia), Amur grape (vitis amurensis), monkshood vine (ampelopsis aconitifolia)) used for the green wall creation may serve as an excellent platform to teach kindergarten children to love and preserve the environment. The creation of green wall brings together the representatives of local Authorities (Municipality), scientists, NGOs and kindergarten staff and supported to increase the level of local environmental quality and public awareness of nature, to provide aesthetic and health benefits. availability to monitor kindergarten’s territory to reveal the extent of green wall pollution prevention capacity. lack of funds, which limited the implementation of nature-based solution only in one kindergarten. The NBS “Green wall for kindergartens” was planned in the frame of H2020 Connecting Nature project. The H2020 Connecting Nature project helped to integrate the 'Nature-Based Solution' concept into Green City Action Plan, which articulates a Yerevan’s sustainable development vision, strategic objectives and actions and investments to address priority environmental issues and meet the plan’s objectives (http://www.yerevan.am/uploads/media/default/0001/72/e7224f93ad7096478f9aaddb96ba61ea0ca693c9.pdf). The funding for the green wall creation was provided by the “Eurasia” CPO.